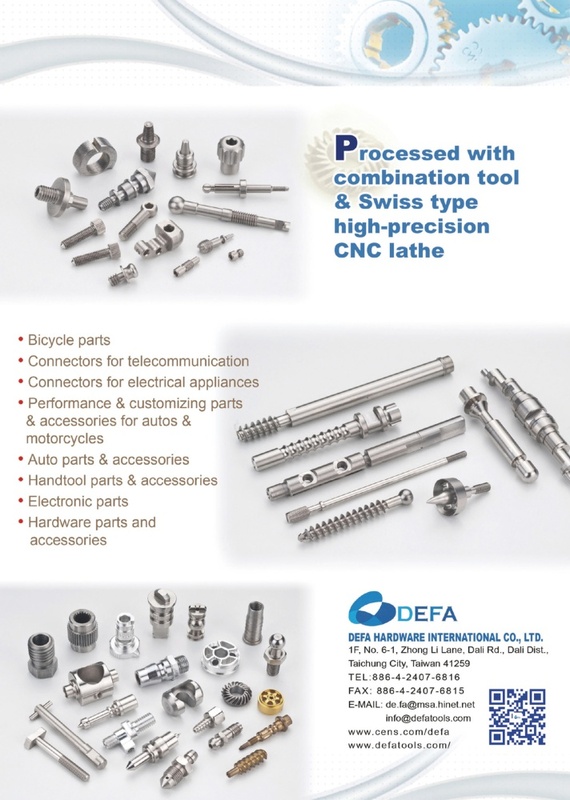 Defa International, Inc is a professional supplier of precision metal parts, can provide all kinds of OEM parts for manufacturing and processing markets. Our facilities are Japan CITIZEN CNC lathe machines, swiss type CNC Lathe machines , CNC precision milling machines and other advanced equipments. We can fast & sophisticate to produce of many kinds of metal parts in materials such as aluminum, iron, stainless steel, copper and special materials. Our product range cover all kinds of pipe fittings, architectural hardware, auto parts, machinery parts, bicycle parts, kitchen and bathroom hardware, medical equipment parts, industrial hardware, valve parts, food machinery parts, hardware tools ... and so on. DEFA can provide customers with the best service, providing tailored support to meet the needs of customer orders. We have a dedicated design department, using ESPRIT CAM integrated solutions to solve precision parts production, and mainly help to develop intuitive and simulate the real effect of the presentation with complete details. In our years of proven experiences, we believe that competitive production cost and excellent manufacturing quality can absolutely convinced that we can sure to meet their requirements according to the specifications. We welcome you to contact us for further! 1. Advanced measuring & testing equipment: high resolution projector, roughness tester, hardness tester, altimeter, all required pin gauges, 2.5D image measuring instrument, and microscope. 2. Inspection report and safety material data are available if needed. 3. Best quality control with kinds of testing machine and rich experienced engineers & inspectors. 4. Offer factory price because we have rich-experience production workers and engineers and strong raw material purchasing team. 5. We have over 32 years experiences in this CNC machining/turning/milling services.